Israel released 26 long-term Palestinian prisoners in the early hours of Wednesday, triggering street parties in the West Bank and Gaza that continued through the night accompanied by music, fireworks, automatic gunfire, and outrage from Israelis over the release of terrorists. The prisoners released on Wednesday were the second group in a total of 104 prisoners who were convicted of killing Israelis before the signing of the Oslo peace accords and who have been jailed for more than 20 years. Their release was demanded by Palestinian leaders as a precondition to the peace talks being conducted under the auspices of the US. The move created tensions in the Israeli cabinet and ignited strong emotions in the Jewish state. In an attempt to calm the storm of opposition from his rightwing supporters, the Israeli prime minister, Binyamin Netanyahu, announced more than 1,000 new housing units and other projects in East Jerusalem and West Bank settlements. 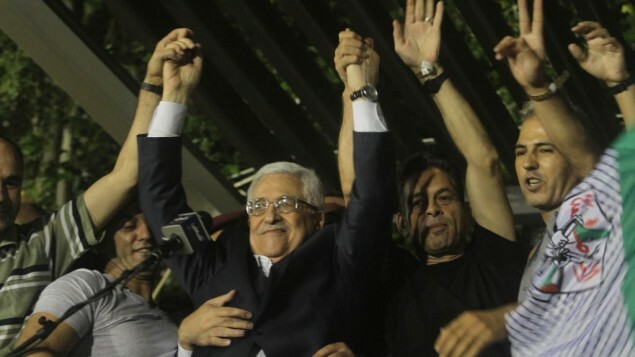 In Palestine, news of further settlement construction could not dampen the celebratory mood as 21 of the freed prisoners were greeted by the Palestinian president, Mahmoud Abbas, and senior officials at an official celebration in the presidential compound in Ramallah. The men laid a wreath at the grave of Yasser Arafat before being presented to a 3,000-strong crowd of family, friends and supporters who had waited until 1am for the emotional reunion. In Gaza, five additional prisoners were greeted with similar celebrations as they returned to their homes. “I promise you now there will be no agreement if there is one prisoner remaining,” he vowed. In nearby El Bireh, hundreds greeted the triumphant homecoming of Israr Samarin and Musa Kar’an, who in 1991 ambushed Tzvi Klein, an off-duty soldier driving to his home in a nearby settlement, and shot him in the head. With loud music blaring from the speakers and supporters firing automatic weapons into the air, the pair mounted a stage constructed in the street to express their happiness. “We as a people love peace, but it must be a peace that protects our honour, that restores our rights and liberates our land, and will uproot all the settlements that strangle our existence and our very selves on this land of Palestine,” he said. For Palestinians the prisoners have become symbols of resistance to Israeli occupation, but many Israelis were shocked by the insistence on the release of prisoners they consider to be cold-blooded killers. Victims’ relatives waged a legal battle up to the last minute to stop the release, arguing that it would encourage more violence. More than 3,000 Israelis staged a demonstration on Monday night, forming a human chain around Ofer prison where the prisoners were being held. A smaller group returned just before the deadline on Tuesday. On Sunday, the economy minister Naftali Bennett’s pro-settler Jewish Home party launched an attack on his cabinet colleague Tzipi Livni, who is leading the peace talks. “The release of prisoners in exchange for the dubious right of Tzipi Livni to meet with Saeb Erekat is most terrible. With all due respect, halting the release of murderers is even more important than justifying Livni’s being in the government,” the party said in a statement, which was furiously denounced by Livni’s supporters as an incitement to violence on the eve of the 18th anniversary of the assassination of the former Israeli prime minister Yitzhak Rabin. Bennett stood by the statement and his party’s proposed legislation to block further prisoner releases. “We are witnessing a tremendous offensive against us,” Bennet said. “The goal is to domesticate us, to force us into the herd mentality. What can we do? We have a different view. Those who support a Palestinian state get support; if you’re against, you are called the extreme right, you’re called a fascist. Gila Molcho, whose brother Ian’s three killers have each been freed in the last three exchanges, said she was reliving the “terrible experience” of the day in 1993 when he was hacked to death while working for a European aid organisation in Gaza. “I feel like I’m in some kind of nightmare,” says bereaved sister of terror victim Ian Feinberg. Her brother, Ian Feinberg, was an attorney working on economic development in Gaza for a European aid organization in 1993. In April of that year, two masked men armed with guns, axes, knives and lead pipes burst into the organization’s offices and hacked Feinberg to death. One of the attackers, Rafat Ali Muhammad Aruki – who was 23 at the time and knew Feinberg personally – was released as part of the prisoner exchange that freed IDF soldier Gilad Shalit. A man convicted of having knowledge of the murder, Yusuf Abdel Al, went free in the prisoner release this past August. The second attacker, Omar Issa Rajib, who was 19 at the time, is slated to go free early Wednesday morning. Molcho said she was appalled that the state would release prisoners convicted of killing Israelis. The release, she said, would beget more terror. She first heard the news from a reporter, not from the government. According to the Almagor Terror Victims Association, half of the victims’ families were not notified ahead of time about the planned releases. In a sign that other victims’ relatives may share Molcho’s exasperation, no members of the victims’ families were present at the High Court of Justice when officials from Almagor submitted a petition on Tuesday afternoon to halt the release. Lizi Hameiri, who is not related to any of the victims, stood outside the High Court on Tuesday to show solidarity with the families and criticize the state’s decision. In wake of Palestinian prisoners’ release, the government approves immediate construction of 1,500 planned housing units in Jerusalem and Judea and Samaria, as well as plans for additional 2,000 housing units • Move said to be coordinated with U.S.
Israel on Tuesday approved the construction of 1,500 housing units in Jerusalem and Judea and Samaria, and green-lighted the planning of 2,000 additional housing units in the area. Senior political sources said construction on the projects is set to begin immediately, as they pertain to plans that have been made public in the past. Another senior political source said that the move was coordinated with the U.S. “It was clear, ahead of the resumption of the negotiations that Israel will not agree to any limitations regarding construction,” he said. The projects include construction in the Ramat Shlomo and Gilo neighborhoods in Jerusalem, in the communities of Adam, Givat Ze’ev, Maaleh Adumim and Beitar Illit in the Jerusalem vicinity area, and in Ariel and Karnei Shomron in Samaria. Future construction plans include additional expansion of Ramat Shlomo and Givat Ze’ev; as well as construction in Kfar Adumim, Almog and Mehola in the Jordan Valley; and in several Judea and Samaria settlements, including Karnei Shomron, Yakir, Shilo, Talmon, Bracha, Ofra and Beit El. Interior Minister Gideon Sa’ar has also garnered Prime Minister Benjamin Netanyahu’s consent to immediately promote several additional projects, including a new tourism and archeology center in the City of David in Jerusalem, and promoting the national park near Mount Scopus. The plans were announced in the wake of the release of 26 Palestinian terrorists, who were paroled as part of a four-phase release schedule pledged by Israel to the Palestinian Authority ahead of the peace talks’ resumption in August. A High Court of Justice petition filed Tuesday by the Almagor Terror Victims Association in hopes of stopping the move was denied, and shortly after midnight, the prisoners left the Ofer Prison, under heavy guard, en route to the West Bank and Gaza Strip. Despite what was describe as emotional pleas by the terror victims’ families, the court denied the petition, saying there was no legal merit to infringe on the government’s decision in the matter. 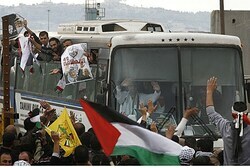 Meanwhile, Palestinians in Ramallah and Gaza celebrated the release of the prisoners. The 21 prisoners returning to the West Bank attended an official reception at the Mukataa in Ramallah, where Palestinian President Mahmoud Abbas greeted them personally. “We welcome our brothers the heroes coming from behind the bars to a world of freedom and liberty,” Abbas was quoted as saying. “No permanent peace agreement would be signed as long as there is one single prisoner in Israeli jails,” Abbas said. Palestinian media reported Tuesday that every prisoner who was released will receive a special grant from the PA, according to the length of his prison sentence. The grants – some of which are expected to amount to tens of thousands of dollars – will join a monthly stipend the PA plans to allot the prisoners, ranging between 2,500 and 4,500 shekels ($710-$1,280) a month. Meir Indor, head of terror victims’ organization Almagor, attacks Supreme Court’s move to release terrorists in the strongest terms. The head of the Almagor organization for the rights of terror victims and their families, Meir Indor, has released a statement attacking the Supreme Court’s decision to proceed with tonight’s scheduled terrorist releases in the strongest terms. The Court also rejected the argument that the release violates the conclusions of the 1995 Shamgar Commission. The Commission “dealt with the issue of releasing prisoners in the case of Israeli kidnappings […] not in the context of international negotiations,” the court ruled. The controversial decision has inspired last-ditch efforts to prevent the terrorist transfer, including a protest by activists blocking the transfer route on Route 443. Court does not find grounds to intervene in prisoner release taking place in the framework of the peace process. The High Court of Justice rejected a petition late Tuesday night by the Almagor Terror Victims Association to block the second round of Palestinian prisoner releases scheduled for the same night as part of the ongoing Israeli- Palestinian peace talks. According to the terms for entering talks, Israel would release four rounds of Palestinian prisoners over nine months as a confidence-building measure for Palestinian participation in the talks. Tuesday’s decision came at lightning speed, with the petition itself being filed only Tuesday afternoon, followed by a rushed hearing by a panel of three justices presided over by Deputy Supreme Court President Miriam Naor. However, it noted that the murderers of Tamam, who were Arab-Israelis, are not among the 26 prisoners listed as part of the current round of releases. The petitioners also claimed that some of the prisoners due to be released violated the government’s own standards and were due to be released in error, as they had committed their crimes post-Oslo. One of the principles of the current prisoner release has been to release only prisoners whose crimes were committed pre-Oslo. The state responded that the defining date for the government’s determination was not the 1993 signing of the Declaration of Principles which started the ball rolling on Oslo, but a 1994 agreement which formalized the 1993 framework, and that all of the crimes came before the 1994 signing. The petitioners also claimed that the first round of prisoner releases was responsible for a recent uptick in terror emanating from the West Bank, and argued for a delay of the release until the issue could be further scrutinized. The state responded that security issues and commitments to the US required the release to go forward Tuesday night as planned. The Supreme Court has rejected a petition against the terrorist release scheduled for tonight, giving green light to free killers. Supreme Court Justices Miriam Naor, Edna Arbel, and Daphne Barak-Erez have rejected the petition by the Almagor organization and by the families of victims of terrorism against the release of 26 terrorists. The Court chose to allow the terrorists to go free. 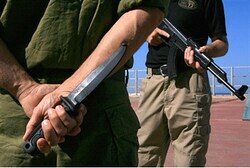 Israeli Police vehicles began to transfer 5 terrorists to the Erez crossing in Gaza before the verdict was handed down. The rest of the terrorists who are to be set free will be released to Judea and Samaria (Shomron) at midnight. Almagor head Meir Indor has previously explained that he sees value in filing petitions against the release of terrorist killers, even knowing that the Supreme Court is unlikely to accept them. “It’s a protest and an educational effort, that makes it clear that we know what is permissible and what is not,” he stated following a similar petition in August. This is the second round of terrorist releases out of a scheduled four. Prime Minister Binyamin Netanyahu has agreed to set free a total of 104 terrorists, many with blood on their hands, in a gesture to Palestinian Authority Chairman Mahmoud Abbas. Netanyahu and Defense Minister Moshe Yaalon have argued that the release of terrorists is a necessary part of Israel’s long-term strategy. However, Deputy Defense Minister Danny Danon argues otherwise, and has warned that setting killers free will encourage terrorists and will be to Israel’s detriment in the long term. The High Court rejected the application by the Almagor Terror Victims Association on Tuesday evening against the release of 26 Palestinian prisoners. The prisoners are being released as part of a deal that was made in July to kick-start the peace negotiations between the Palestinians and the Israelis. The High Court ruled that it did not have jurisdiction on the matter and that two prior applications that challenged the government’s decision were similarly rejected. Deputy Defense Minister Danny Danon (Likud) said Tuesday “The images of the freed killers tonight will be engraved on the memories of the future generation of terrorists who will also dream of returning home as heroes.” Danon was speaking at a conference in Beit Shemesh. Still no answer from Supreme Court regarding legality of terrorist release; the Israeli Police has already begun transfers. The release of 26 terrorists from Ofer prison has already begun, despite reports that the Supreme Court is still at recess in the midst of hearings regarding its legality. Israel’s Supreme Court convened a hearing today (Tuesday) regarding a petition from the “Almagor” organization for terrorist victims and their families against the Palestinian Arab terrorist release and have taken a recess. The recess was called as state officials delayed a response to the justices’ queries. The Court had asked whether the terrorist release had to proceed at midnight tonight (Tuesday), or whether the state can postpone the release until the completion of proper legal proceedings. Additional inquiries were made in regard to the conclusions of the 1995 Shamgar Commission, particularly those regarding the official policy for prisoner exchanges. If the petition is accepted, the terrorist release of Palestinian Arab criminals from Ofer Prison to their homes scheduled for tonight will be postponed. This is the second release out of four scheduled, with a total of 104 terrorists scheduled to be returned to the Palestinian Authority. The issue still remains undecided. Despite this, IPS vehicles are already transferring 5 terrorists to the Erez crossing into Gaza, reports say. The prisoners will be given time to prepare near the entrance to Gaza, and are scheduled to cross into the Hamas-controlled territory at midnight. For the second time since restarting negotiations with the Palestinian Authority, Israel is in the process of releasing terrorists from its prisons. As The AJN went to press, Jerusalem was making final preparations to release 26 prisoners held in Israeli jails. All of them committed acts of terror before the Oslo peace process began in the 1990s. While the first release in August generated some internal tensions, the reaction on the Israeli right this time around has been much sharper, in a large part because the recent spate of terror incidents in the West Bank has increased antagonism towards Palestinians. As well as proving divisive in the government, this week’s release generated popular protest, with almost 3000 people demonstrating against the release outside the prison where the inmates were held. One group set up to oppose the release, which calls itself Sorry We Forgot, placed signs over graves in Israel’s most important military cemetery, on Mount Herzl. The signs, which bore a mock signature by the “government of Israel,” said: “From our perspective, your deaths were in vain.” The group claims that releasing terrorists undermines the efforts of soldiers who risked their life to arrest them. The terrorists leaving prison include Shabir Kassem Hazem, who together with a partner killed Holocaust survivor Isaac Rothenberg with an axe 20 years ago. Ahmed Damouni murdered army reservist Amnon Pomerantz, who got lost on his way to an army base, in 1990. Another killer going free is Rahman Abdel Hajj, who murdered Genia Friedman, a woman who was out walking in Petach Tikvah in 1992. Israel’s Prime Minister Benjamin Netanyahu said that whatever opposition has surfaced towards the US-brokered release, it had to go ahead. “We have to honour government decisions even if it is difficult and unpleasant, we can’t constantly change our stance,” he told his cabinet. A statement from the government stressed that it will work to ensure that the prisoners released do not reoffend, saying that “any prisoner who resumes hostile activity will be returned to serve the remainder of his sentence.” Shortly before the scheduled release, Israel’s chief negotiator Tzipi Livni claimed that it was in the “national interest” and Strategic Affairs Minister Yuval Steinitz said that it is preferable to freezing settlement, which was an alternative concession requested by the Palestinians in the framework of the negotiations. The Almagor organisation of terror victims’ families, asked the High Court to intervene to stop the release, claiming in a petition that freeing terrorists “strikes a fatal blow to the existence of a society founded on the values of ethics and law.” The court rejected its request. Israeli warplanes raided the northern Gaza Strip on Monday after militants fired rockets over the border, as Israel readied to free a new batch of long-term Palestinian prisoners. It was the first air strike on Gaza in more than two months and came shortly after two rockets were fired towards southern Israel. Despite the flareup along the Gaza border, which has been quiet for months, Israeli officials said it was unlikely to affect the prisoner release which is due to take place on Tuesday night as part of the ongoing direct peace talks with the Palestinians. Witnesses said the air strike targeted a training ground west of Beit Lahiya that was used by militants from the armed wing of Gaza’s ruling Hamas movement. Neither the air strike nor the earlier rocket attacks on southern Israel caused any damage or casualties. The Israeli military said the air force had struck “two concealed rocket launchers” in northern Gaza following an earlier cross-border attack. Earlier on Monday, militants fired two rockets at the southern Israeli port city of Ashkelon, one of which was shot down by the Iron Dome missile defence system, the army said. And on Sunday, a mortar shell was fired over the border that also caused no damage or injuries. In September, there were two instances of rocket fire, but Israel did not respond. It was the first Israeli air strike since August 14 when the air force hit targets in the same area, also in response to rocket fire. That attack occurred just hours after Israel released a first batch of 26 Palestinian prisoners in line with commitments which led to a resumption of direct peace talks in late July, following months of sustained US pressure. But Monday’s scuffle along the Gaza border was not expected to have any impact on plans to free a second batch of prisoners, with a senior official telling AFP it “won’t delay” the release of 26 another inmates. The list of prisoners slated for release, 21 of them from the West Bank and five from Gaza, was approved on Monday by senior Israeli ministers. The names were published later that night, giving victims’ families and groups 48 hours to mount a legal challenge before the release goes ahead. All but one of them were arrested before the signing of the 1993 Oslo peace accords, which won the Palestinians limited self-rule but failed to bring about an independent state. All were convicted of murdering Israelis, according to the details published by Israel’s prison service. A Fatah official told AFP that 19 of the prisoners set to be freed were members of its movement, which is led by Palestinian president Mahmud Abbas, while four belong to the Popular Front for the Liberation of Palestine (PFLP) and three to Hamas. Meir Indor, head of Almagor, a group representing Israeli victims of Palestinian attacks, told AFP his organisation would be petitioning the high court against the impending release. Israeli Prime Minister Benjamin Netanyahu pledged to release a total of 104 Palestinians in four stages in line with commitments which brought about a resumption of US-brokered direct talks on July 30 after a hiatus of nearly three years. Netanyahu reiterated on Monday at a meeting of his ruling rightwing Likud party that “we must take into account the weight of reality” and fulfill those commitments to release prisoners. Last week, an Israeli official said that in parallel with the release, a new batch of tenders would be announced for construction in settlements in the West Bank and annexed east Jerusalem, in a move allegedly coordinated in advance with the US and the Palestinians. The Palestinians have denied any such link. 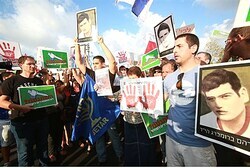 Outside a jail in the West Bank, some 2,000 Israelis have protested at the imminent release of 26 Palestinian prisoners. They are the latest batch of inmates that Israel is letting go as part of US-sponsored Middle East peace talks. Demonstrators outside the Ofer Prison near Ramallah denounced the move as an insult to victims. Friends and relatives held pictures of victims. But the families of those being freed take a different view. For them the prisoners are heroes in a struggle for statehood. Peace talks have showed few obvious signs of progress since they resumed in the summer. Over 4,500 people attend protest rally outside Ofer Prison • Brother of terror victim says “a red line has been crossed” • Housing and Construction Minister Uri Ariel (Habayit Hayehudi) attends rally, calls for halt of prisoner release. The government’s decision to release Palestinian prisoners, many of whom are considered “heavyweight terrorists,” has met scathing criticism from terror victims’ families. The Almagor Terror Victims Association plans to petition the High Court of Justice on Tuesday in the hope that the court will order the government to suspend the prisoners’ release. The petition’s chances, however, are slim, as the High Court traditionally refrains from interfering with government decisions of this nature. Monday saw members of the bereaved families hold a protest rally outside the Ofer Prison, to which the Palestinian prisoners included in the second-phase release have been transferred. Over 4,500 people attended the rally, which was organized by Almagor, joining hands and creating a human chain that surrounded much of the prison’s exterior compound. 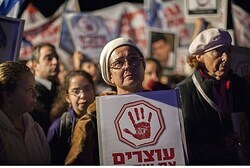 Some protesters carried signs reading “Jewish blood is not cheap” and “Stop the prisoners’ release.” Others were carrying photos of loved ones killed in terror attacks. Housing and Construction Minister Uri Ariel (Habayit Hayehudi), who attended the rally, was booed when he tried to address the crowd. After the heckling subsided, he told the families that he supported their fight. “It is time to stop the release of terrorists. This is not Jewish ethics,” he said. On Monday, after receiving the final list of prisoners slated to be released, the Israel Prison Service’s Nachshon Prisoner Transports Unit transferred the 26 prisoners in question to Ofer Prison, where they underwent the routine identification verification and medical examination process. The prisoners also signed a legal document stipulating that they would abandon all terror-related activities as a condition of their release. They are scheduled to leave the prison late Tuesday night under heavy guard, as 21 of them will be shuttled to the Bitunia checkpoint and will return to the West Bank, while the remaining five will return to the Gaza Strip via the Erez crossing. Palestinian Prisoner Affairs Minister Issa Qaraqe said the prisoner release was giving people hope. “I think that releasing prisoners deepens the peace process, and gives it credibility and also gives hope that all Palestinian prisoners could be released,” Qaraqe said. Families of Palestinian prisoners set to be released were preparing Monday for homecoming celebrations. The prisoners returning to the West Bank will be met with an official reception at the Mukataa in Ramallah, where Palestinian President Mahmoud Abbas is expected to greet them personally. In Gaza, meanwhile, Hamas is said to be downplaying the release, and no official celebrations are planned. Dozens of buses from all over Israel to converge outside Ofer Prison, where terrorists will be freed. Dozens of buses from all over Israel are to bring protesters to a planned large-scale demonstration Monday evening, against the release of terrorist murderers scheduled for Tuesday. The protest will take place outside Ofer Prison, north of Jerusalem, where the terrorists selected for release to Judea and Samaria are being gathered ahead of their bus ride to freedom. The rally is being organized by My Israel – a grassroots group founded by Bayit Yehudi (Jewish Home) head Naftali Bennett before he joined party politics – the Almagor terror victims’ group and other organizations. Relatives of terror victims, MKs and other public figures are expected to take part in the rally. The protesters will form a human chain outside the gates to the jail, and demand that the prisoner release be halted. They will hold up signs with images of bloody hands, and red glow sticks. The protesters will hold photos of the victims whose murderers are being released, and films about bereaved families will be shown. The list of terrorists to be released and their crimes has been made public, drawing widespread revulsion and reigniting popular anger at what is seen by most Israelis as a betrayal of justice. Israel announced Monday that it will free 26 more Palestinian prisoners convicted of killing Israelis, saying it was fulfilling its commitment to U.S. diplomats as part of ongoing peace negotiations, despite intense opposition within Prime Minister Benjamin Netanyahu’s cabinet. Netanyahu agreed months ago to free 104 Palestinian militants as part of a deal brokered by Secretary of State John F. Kerry to get the Palestinian Authority, which governs the West Bank, to the negotiating table. Many of the prisoners were serving life sentences for killing Israeli civilians in the late 1980s and early 1990s. The first group of 26 prisoners was released in August, triggering an emotional outpouring among the families of those they had killed. All the Palestinians slated to be freed this week were convicted of killing Israelis and have spent 19 to 28 years in Israeli prisons. The majority are from the West Bank. Five are from the Gaza Strip, governed by the Islamist group Hamas, which does not recognize Israel. Among the prisoners who will be freed is Omar Issa Masoud, convicted of murdering Ian Feinberg, a lawyer who had been working in Gaza to help improve the economic conditions of Palestinians. Feinberg, 30, was slain in April 1993, when gunmen stormed an aid meeting in Gaza City that he was attending. Another prisoner on the list is Hazem Kassem Shbair, convicted of murdering Holocaust survivor Isaac Rotenberg at a construction site where the two worked together. The Almagor Terror Victims Association in Israel said that most of Rotenberg’s family had been killed during World War II but that he managed to escape, arriving in Israel in 1947. Rotenberg was bludgeoned to death with an ax in 1994, when he was 67. Parliament member David Tsur of the left-leaning Hatnua party told Ynetnews.com that he considered the release of such prisoners “improper conduct” and would have preferred that the government instead offer the Palestinians the carrot of halting settlement construction in the West Bank. “Releasing terrorists is irreversible,” Tsur said. Economy and Trade Minister Naftali Bennett, head of the right-wing Jewish Home party and the third most powerful member of Netanyahu’s government, tried to stop the prisoner release, saying it was “a dubious privilege” to have Israeli negotiators sit with their Palestinian counterparts. Palestinian Authority President Mahmoud Abbas is planning to welcome the freed prisoners in a celebration in Ramallah late Tuesday, officials said. Critics of the release were given fresh ammunition after two missiles were fired from the Gaza Strip into Israel early Monday. No one asserted responsibility, and no one was injured. One missile was intercepted by Israel’s U.S.-funded Iron Dome missile defense system above the coastal city of Ashkelon. The other rocket landed in an uninhabited patch of land nearby. The Israeli air force retaliated with an attack on two clandestine rocket launchpads north of Gaza City. Hard-line Israeli politicians opposed to the prisoner release — and to negotiations that would give away land for a future Palestinian state — said the rocket fire showed that there was no trustworthy partner for peace on the Palestinian side. On Sunday, two mortar rounds were fired at Israel from Gaza. And earlier this month, Israel’s military shut down a “terror tunnel” that led from the Palestinian territory into the Jewish state. Lt. Col. Peter Lerner, a spokesman for the Israel Defense Forces, said the tunnel was designed to facilitate attacks on Israel, such as the kidnapping of Israeli troops, the planting of explosive devices or the moving of militants across the border. Israel’s decision to strike the concealed rocket-launch sites Monday “shows our capability and our knowledge,” Lerner said, and puts Hamas on notice about Israel’s intent to respond to any provocations with force. Israeli aircraft pounded rocket-­launch sites in response to rocket fire Aug. 14, Israeli officials said, and hit targets in Gaza on June 24, April 28 and April 3. “The real question,” Levitt said, is why the rockets continue to be fired from Gaza, despite the relative calm in the area. He said the answer might be linked to Gaza’s increasing isolation, after the ouster of the Islamist government of President Mohamed Morsi in neighboring Egypt. Since removing Morsi in a coup, Egypt’s military has destroyed or sealed most of the smuggling tunnels between Egypt and Gaza and has repeatedly shut down a pedestrian crossing into Gaza at Rafah. Those moves denied Hamas its “tax revenue” from the tunnels, further battered the weak Gazan economy and effectively sealed off the coastal enclave. The Israel Prison Service published the names late Sunday night of 26 Palestinian prisoners set to be released over the next 48 hours as part of a deal to keep the US-brokered Israeli-Palestinian peace talks on course. All are convicted murderers. Six of the inmates have been imprisoned for just under 30 years, one of whom was due to be released in four years. All were imprisoned for murders committed before the signing of the 1993 Oslo Peace Accords. A government statement said earlier that 21 of the inmates were from the West Bank and five were from the Gaza Strip. Among the prisoners to go free is Damouni Saad Mohammed Ahmed, who was convicted in the 1990 lynch of IDF reservist Amnon Pomerantz in the Gaza Strip; Pomerantz’s car was set on fire while he was inside. The other convicted murderer of Pomerantz is not among those set to be released. The killer behind the 1993 murder of South-African-born Ian Feinberg, a 30-year-old lawyer and activist working with Palestinians in Gaza, will also be set free. Masoud Issa Rajeb Amer, a member of the PFLP, was sentenced to three life sentences for the killing, which was perpetrated with a hatchet. On April 18, 1993, Feinberg participated in a meeting in the Gaza offices of a European-funded NGO involved in aid projects when terrorists burst in, ordered everyone, except Feinberg, to the floor, and proceeded to kill him. Massalha Awwad Mohammed Yusuf and Amawi Hamed Alabad Halmi, both Hamas members who killed 22-year-old Yigal Vaknin in 1993, are also on the list. Vaknin was lured with a plea for help and stabbed to death. His body was found in a field near his home in Moshav Bazra in the Sharon region, two hours before the start on Yom Kippur that year. Yusuf was originally sentenced to two life terms for the killing. Also included is Haga Salim Mahmud Mo’id who in May 1992 swam from Aqaba, Jordan to Eilat along with three other terrorists and shot 62-year-old Yosef Shirazi to death. Various weapons were found on Mo’id which led authorities to believe they planned a much larger attack. The planned release constitutes the second phase of a four-stage prisoner release deal, agreed to as part of the talks which restarted in July. Israel released a first group of prisoners in August. Earlier Sunday, a ministerial committee headed by Prime Minister Benjamin Netanyahu approved on the names of those Palestinians set to go free on Tuesday. “A list of the prisoners is to be published Sunday night on the website of the Israel Prisons Service, after the bereaved families have been informed,” the statement said. The releases were expected to be accompanied by the announcement of new plans for West Bank settlement construction, a senior Israeli official said. The religious, nationalist Jewish Home party has bitterly attacked the planned prisoner releases in recent days. On Sunday, the party proposed legislation to prevent future releases. Opposed by Netanyahu, the bill was rejected by the Ministerial Committee for Legislation in an 8–5 vote. The Jewish Home’s decision to push forward with the bill drew harsh criticism from Likud ministers and other coalition partners. Justice Minister Tzipi Livni (Hatnua), who is heading off negotiations with the Palestinians, criticized Jewish Home and said that the committee vote showed which coalition parties truly had the nation’s needs at heart. “Today it has once again been made clear that the government, in contrast to one of its member parties, is acting in the national interest and not according to the instructions of the rabbis in the West Bank,” she said. Interior Minister Gideon Sa’ar (Likud) denounced the Jewish Home ministers for failing to toe the government line. Although the prisoner release deal was approved by Netanyahu, Jewish Home, led by Economics Minister Naftali Bennett, blamed Livni for it. MK Ayelet Shaked of Jewish Home told Channel 2 Saturday that Jewish Home had made its opposition clear to Netanyahu. ”We told the prime minister that we are against the release of terrorists. It’s immoral. No other country in the world does it,” she said. Hatnua’s Environment Minister Amir Peretz said earlier Sunday that Jewish Home could have prevented the release by agreeing to a halt in settlement building, but is instead trying to paper over its own involvement in the government move. A senior Israeli official said the Americans and Palestinians were aware of Israel’s intentions to build more settlement homes, which had been made clear before talks resumed. The official said that any new construction would take place inside the major blocs Israel aims to keep in any future peace deal. In previous rounds of negotiations, the Palestinians agreed in principle to swap some West Bank land for Israeli territory to allow Israel to annex some settled areas adjacent to the 1967 lines. Netanyahu has faced pressure from hawkish ministers to delay or cancel the prisoner releases in the wake of a series of violent incidents in the West Bank in recent weeks, including the killing of two IDF soldiers and an attack that wounded a 9-year-old girl in the settlement of Psagot. Deputy Defense Minister Danny Danon (Likud) also slammed the planned prisoner release, saying it only strengthened terror. ”We’ll see the celebrations in Gaza, in Ramallah, in Nablus. This only strengthens those who seek to harm [us],” he told Army Radio Saturday. ”Any approval of settlement construction should not be linked to these releases,” he added. Netanyahu has resisted the pressure from the right and plans to release the prisoners on schedule, the prime minister’s representative in the peace talks, attorney Yitzhak Molcho, assured Palestinian and American officials in recent days. In July, Israel agreed to the four-phase release of 104 prisoners, many of whom were convicted of brutal murders, serving sentences for acts of terror committed before the signing of the Oslo Accords in 1993. Twenty-six prisoners were released in the first wave on August 13, just after talks started. The deal was intended as a sign of good faith ahead of the renewed American-brokered peace talks between Israel and the Palestinians. Senior Palestinian sources in Ramallah on Sunday told Israel Hayom that the second wave of Palestinian prisoner releases will be carried out as planned this Tuesday. A senior official in Ramallah told Israel Hayom that they had not yet received the list of prisoners from Israel and that the identities of the prisoners to be released are as yet unclear. He said that in any case it will be a subset of 26 prisoners from among the 104 prisoners jailed in Israeli prisons prior to the signing of the Oslo accords in 1994. According to the senior Palestinian Authority official, almost all the prisoners to be released in the second round were convicted of murder, aiding and abetting murder and manslaughter out of nationalistic motives. The senior Palestinian official also said that as part of the memorandum of understanding signed by the sides prior to the start of negotiations, Israel would have the right to decide which of the released prisoners could return to his home in the West Bank and which West Bank residents would be banished to the Gaza Strip based on the demands of the Israeli defense establishment. The defense establishment will decide which are the most dangerous prisoners in terms of the likelihood that if allowed to return to the West Bank, they would re-establish terror cells and terror infrastructure there. Meanwhile, against the backdrop of the expected release of terrorists this week, there has been a severe conflict between Prime Minister Benjamin Netanyahu and Habayit Hayehudi Chairman Naftali Bennett. The arena of the conflict is mainly in the ministerial committee on legislation, which will convene on Sunday to discuss a proposed law that Bennett is promoting and whose purpose is to prevent large-scale releases of prisoners in the future. Netanyahu opposes the law, claiming that it limits the maneuvering room of the diplomatic echelon, and at this stage it is unclear whether it will gain enough support to pass, because the result depends on the vote of several Likud ministers who are under pressure to oppose the bill. Foremost among these ministers are Interior Minister Gideon Sa’ar and Culture and Sport Minister Limor Livnat. Last week, incidentally, a decision passed the ministerial committee for legislation not to allow negotiations over dividing Jerusalem without the support of 80 Knesset members. In tandem with the fight over the proposed law, Habayit Hayehudi and parts of Likud-Beytenu continue their efforts to halt the government’s decision about three months ago to release 104 terrorists as part of the agreement to conduct negotiations with PA President Mahmoud Abbas. At the time, the government decided that the terrorists would be released in four rounds over a period of nine months, in parallel with progress in the negotiations. This coming Thursday, the second wave of 26 prisoners is expected to be released. The prime minister’s attempt to soften the release by promoting building in the settlements — encountered resistance and a direct attack by Habayit Hayehudi on Netanyahu and on the person described as his “partner,” Justice Minister Tzipi Livni, who is leading the negotiations with the Palestinians on the government’s behalf. The chairwoman of the ministerial committee on legislation, Livni, does not intend to bring to a vote on Sunday Habayit Hayehudi’s proposed legislation to prevent the release of terrorists. Her associates say that the matter only came up on Friday and has not yet been studied by professionals and that a final decision will be made this morning. In Habayit Hayehudi they are criticizing Livni and saying that talks with Saeb Erekat are not a good reason to release murderers, or to delay the proposed law preventing the release of prisoners. “The release of prisoners in exchange for the dubious right of Tzipi Livni to meet with Saeb Erekat is most terrible. With all due respect, halting the release of murderers is even more important than justifying Livni’s being in the government,” said the statement. Israel’s diplomatic echelon is denying reports disseminated of late by the Palestinians, to the effect that Israel will also transfer to the PA bodies of terrorists as part of the waves of prisoner release. Habayit Hayehudi’s reaction also stated that democracy also requires bringing to a vote laws that Livni does not necessarily agree with. 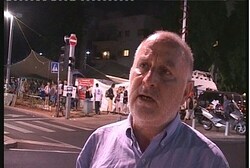 Close associates of the justice minister accused the party and its chairman, Naftali Bennett, of incitement. The ministerial committee for Palestinian prisoner release headed by Netanyahu is expected to convene Sunday evening to discuss the list of prisoners expected to be released in the second round. Over the weekend, Habayit Hayehudi released a statement in which it accused Livni of pushing Netanyahu to hold negotiations with the Palestinians, and that it is due to her that murderous prisoners are being released. Meanwhile, Environmental Protection Minister Amir Peretz from Hatnuah warns that “incitement,” as he calls it, of Habayit Hayehudi towards Livni and Hatnuah could lead to disaster. What starts with spitting, he said, could lead to murder. He was responding to the arrest last week of a 17-year-old youth from a moshav in the north on suspicions that he spat on MK Elazar Stern from Hatnuah. According to Peretz, the members of Habayit Hayehudi are acting hypocritically. “On the one hand they enjoy the perks of being in the government and on the other hand, attack the government over the decision to release prisoners, when they themselves participated in the vote,” Peretz said. He also said it would have been possible to avoid the release of prisoners if Habayit Hayehudi had agreed to freeze settlement construction during the negotiations. MK Ayelet Shaked responded that Peretz was lying because the spitting incident against Stern was not out of diplomatic motives. She also said that the possibility never came up to freeze construction in Judea and Samaria in place of releasing Palestinian prisoners. She added that nothing would come out of the diplomatic negotiations except for the release of prisoners. Netanyahu set to divulge the identities of the Palestinian prisoners slated for release next week in the second phase of Israel’s agreement with the Palestinian Authority to resume peace talks • Bennett: Don’t free terrorists, don’t build. Netanyahu was planning to divulge the identities of the 32 convicted terrorists comprising the second batch of Palestinian prisoners during the weekly Cabinet meeting on Sunday. Officials in the Prime Minister’s Office did not reveal which building projects were to be greenlighted, the number of housing units in question, or which programs the government would seek to advance in order to ease pressure on Netanyahu for his decision to fulfill his obligation and release the convicted terrorists. The Prime Minister’s Office denied reports that Israel was going to return the bodies of terrorists in the current phase. An unnamed official told Reuters that “both the Americans and the Palestinians have been aware of these understandings.” There was no immediate comment from either of those parties. According to the Associated Press, an unnamed Israeli official said that any new construction would take place inside the major settlement blocs that Israel would likely keep in a future peace deal. The announcement came a day after Netanyahu and U.S. Secretary of State John Kerry met in Rome, where the Israeli-Palestinian talks were on the agenda. Meanwhile, dissension within the government has grown over the second phase of the prisoner release. Economy and Trade Minister Naftali Bennett (Habayit Hayehudi) criticized the prime minister’s willingness to release terrorists, despite Netanyahu’s pledge to keep building in the settlements, the support center of Bennett’s party. “The attempt to combine construction with freeing murderers is cynical and morally wrong. It would be better for the prime minister not to free murderers and not to build,” he said. The new bill “would stop the shameful release of terrorist prisoners in the future and we even expect Likud ministers to support [it],” said Habayit Heyehudi in a press release. The bill has also received signatures from MKs in Netanyahu’s Likud party and United Torah Judaism. Earlier this week, Defense Minister Moshe Ya’alon, also a Likud member, said the government would not backtrack on the prisoner release. He said the recent wave of violence sweeping the West Bank—including terrorist attacks that resulted in the deaths of two soldiers and one former colonel—would also have no effect on government plans. The forum of bereaved families and the Almagor Terror Victims Association—which protested the deal from the outset—released a candid letter highlighting the recent spate of West Bank violence and demanding deliberations over the upcoming prisoner release. Deputy Defense Minister Danny Danon—a vociferous opponent to any peace deal with the Palestinian Authority at the present time—wrote a letter to several ministers on Thursday asking for opposition to the plan. “I am calling on you to oppose the irresponsible release of terrorists, which jeopardizes the security of Israelis. Releasing terrorists without conditions constitutes a prize for terrorism and encourages future terrorists,” the letter read. The non-governmental organization which advocates on behalf of bereaved kin who lost loved ones in terrorist attacks demanded on Thursday that the ombudsman and the attorney general order the government to reconsider the release of Palestinian terrorists just a week before 30 more are due to be freed. The Israeli government approved the release of over 100 Palestinians as a gesture to PA chief Mahmoud Abbas just prior to the re-launch of peace negotiations. According to Israel Radio, the organization, Almagor, is arguing that the recent spike in terrorist incidents in the West Bank mandates a reconsideration of the controversial decision to release the Palestinian convicts. Analyst warns of attempt to downplay near-deadly attack. “Only an Arab or Nazi could stab a child,” he says. Israel’s security apparatus is trying to downplay the Saturday night attack in Psagot in which an Arab man stabbed a young girl, warns Dr. Aryeh Bachrach, a current events analyst and head of the Almagor Bereaved Parents’ Forum. Speaking to Arutz Sheva, Bachrach noted that from the beginning of the week, security personnel have been saying that the stabbing of nine-year-old Noam Glick may occurred in the course of an attempted robbery, rather than as part of a planned terrorist attack. “Someone is trying to spread the sense that everything is OK, that there is no deterioration in security and that we can continue the negotiations [with the Palestinian Authority],” he said. However, the act of stabbing itself proves terrorist intent, he argued. “To stand next to a nine-year-old girl and shoot or stab her—only an Arab or a Nazi could do that,” he declared. “It’s reminiscent of the murder of Shalhevet Pass, or of what happened with the Fogel family, when a terrorist went back into the home in order to murder one more little girl [3-month-old Hadas Fogel—ed.] who they hadn’t managed to kill earlier,” Bachrach said. Arab terrorists are the ones who hurt Arab children, too, he added. “Only an Arab could hide behind little children and shoot at IDF soldiers… No soldier could intentionally hurt children,” he argued. The attacker in Psagot targeted 9-year-old Noam as she played on the balcony of her family home. According to initial reports he shot her in the neck, although later reports said she had been stabbed. Noam was badly injured in the attack, but made a rapid recovery, and was able to return home earlier this week.